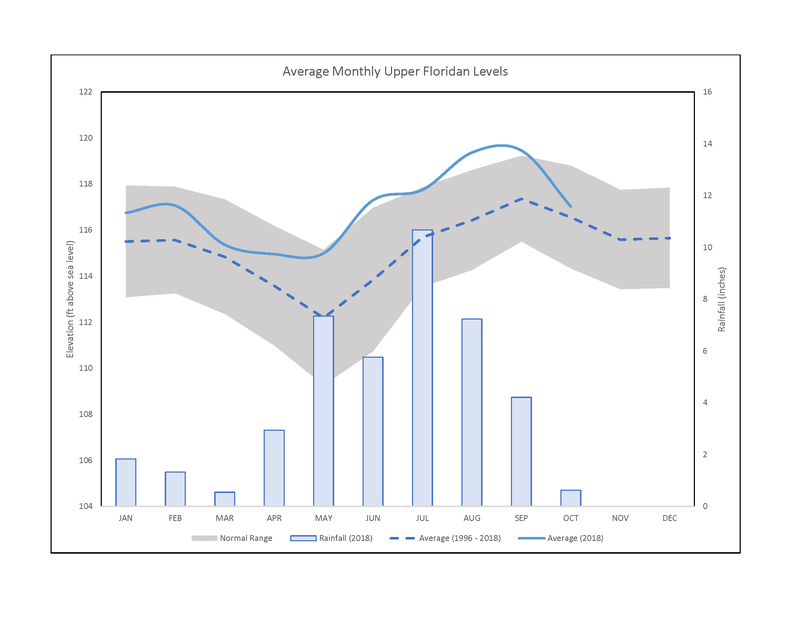 Due to the effects of localized rainfall, data from multiple sources across the greater Winter Haven area is compiled to calculate an average value for gross rainfall. The City received 0.63 inches of rainfall in October. Not only is this amount well below the 2.9 inches this area typically receives on average, but it is lower than the historic normal range (1.15 inches) compared to data collected as far back as 1915. In Figure 1, we can clearly see a sharp decline in the rainfall average from September to October—a visual representation of the transition from Florida’s wet season into the drier Fall and Winter months. As a purely rainfall driven system, the abundance or lack of precipitation carries significant hydrological impacts for the Winter Haven area. Understanding when there is a surplus or deficit of rainfall is important for matters of drinking water conservation as well as for environmental factors like the potential for wildfire. Calculating the general net gain or loss of water for the area involves subtracting evapotranspiration (water loss due to evaporation & plant uptake) from the gross rainfall total. For the month of October, Winter Haven posted a 2.66 inch rainfall deficit. Despite this loss of water due to below average rainfall, the surpluses from previous months have allowed for a positive net gain this year so far. 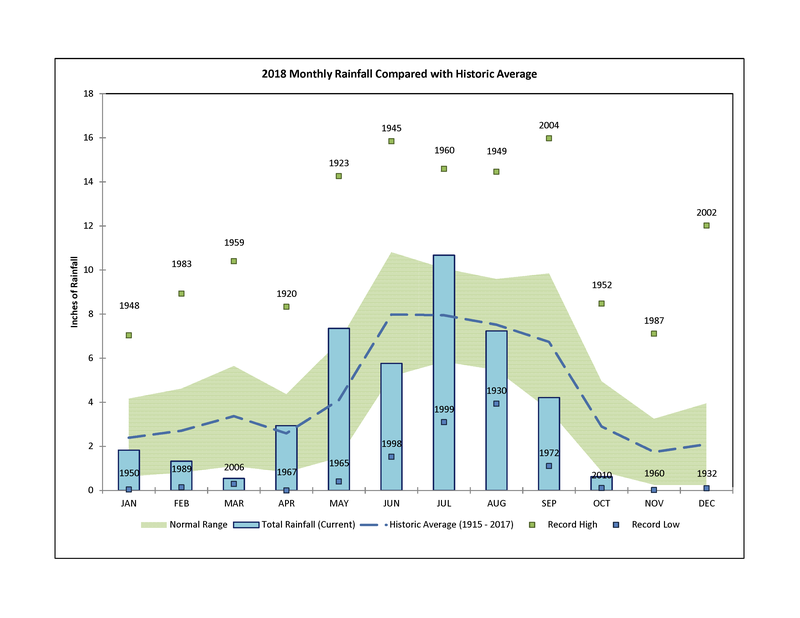 The monthly net changes in rainfall can be observed in Figure 2. As was mentioned above, the gain or loss of water via precipitation impacts multiple factors such as lake surface levels and groundwater recharge. 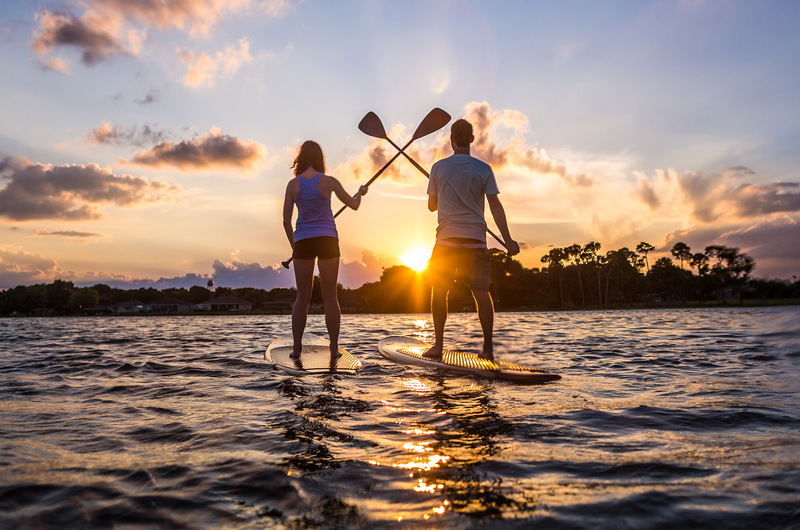 As most long-time Winter Haven residents can attest to, the level of our lakes can affect things like navigation through canals, access to fishing spots, and potential flooding along lakeshore properties. It is because of these reasons that it is important to monitor the regular fluctuation in lake surface levels. 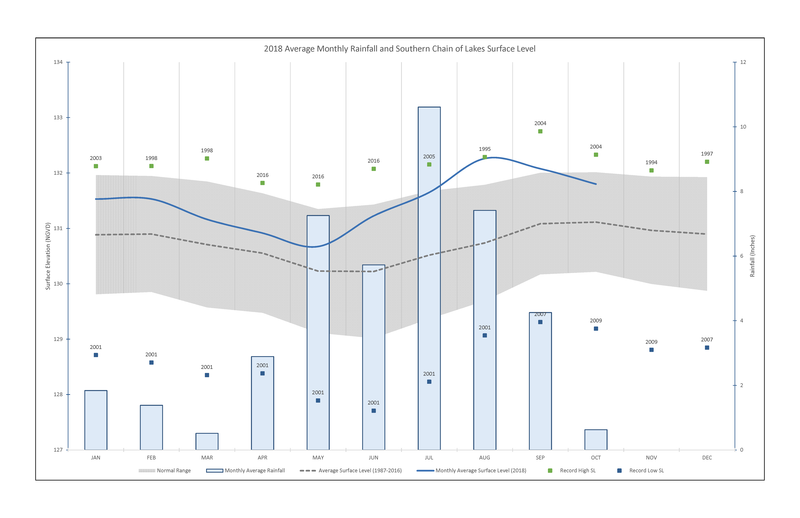 The monthly average surface level for the Southern Chain of Lakes decreased slightly from 132.01 ft above sea level in September to 131.8 ft in October. Figure 3, illustrates this drop in lake stage. One point to make note of that the current average Chain level is still in the upper portion of the historic normal range for this time of year. The canals are still quite navigable and the amount of water held in the Chain will allow for groundwater replenishment as we move deeper into the Florida dry season. A report on hydrology would not be complete without some analysis of groundwater. Therefore, the monthly fluctuation of the Upper Floridan Aquifer (UFA) will be the highlight of this section’s debut. The Southwest Florida Water Management District maintains an UFA monitoring well downtown near the peak of the Winter Haven Ridge (a point roughly 168 ft above sea level). 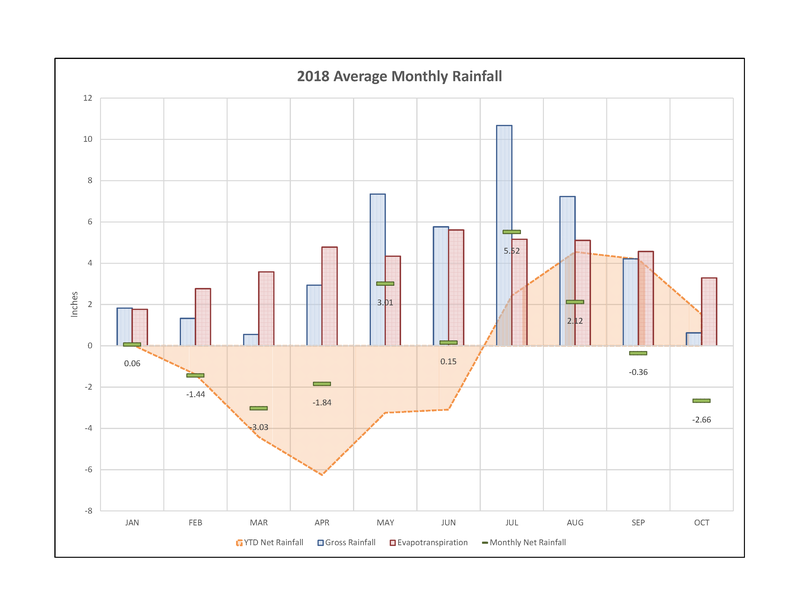 Figure 4 illustrates how the monthly UFA fluctuations in 2018, the historic average and normal range, as well as a comparison to the monthly rainfall totals this year. What’s potentially the most important piece of information gleaned from this data is that the UFA level has remained above the historic average for the entirety of 2018. This is fantastic from a water conservation standpoint! One other point to make note of is the roughly one month lag time after a net rainfall gain and an increase in the UFA level. With the top of the aquifer between 40 and 60 feet below the surface, it takes quite some time for the rain water to percolate and recharge the UFA.